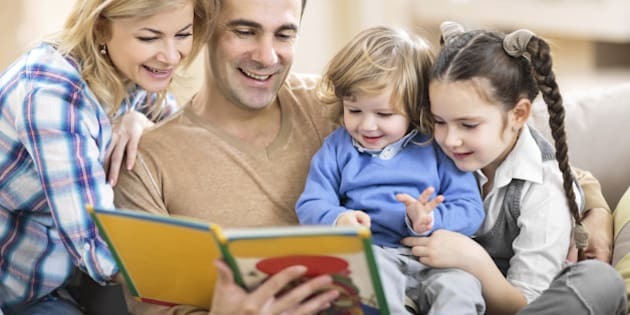 Some parents will read the same children's picture book more than 100 times. Being able to recite a children's book by heart is a badge of honour and represents many hours in the reading-aloud trenches. Smiling parents reading a book to their little children. A book with a secret message makes story time more interesting for everyone. Enthusiasm is infectious and picture books are not just for kids. Here are seven Australian children's picture books with a secret (or not so secret) message. This is a book about learning to love who you are. Even if you don't have sparkles. Thelma is a pony who wants to be a Unicorn. Her friends tell her that she is perfect just as she is. When Thelma gets drenched with pink glitter she becomes "special". Once Thelma is famous, she realises that fame is not all it is cracked up to be. Thelma eventually decides she would rather just be herself. This is a great read aloud and suitable for ages 4 and up. Secret message for the grown-up reader: Turn off the Kardashians. Fame for Fame's sake is no great achievement. Please teach your kids that. Alfie is a Crocodile and his mother asks him to get himself ready to go to the park. Alfie gets distracted by balls, a cat called Steve McQueen and a paper bag. Yet he still wants to dress himself. Alfie's frustrated mum is constantly saying "Hurry up, Alfie." Anna Walker has captured the battle to get out the door in many households every day. Secret Message: Kids, seriously, please get yourself dressed so we can get out the door. We do it every morning. Why is it so DIFFICULT? This picture book, with a magical Alice In Wonderland quality, is full of imagination. It tells a simple story of two siblings exploring outside. With evocative language it shows us that outside can be a magical place. The children in the story enjoy a picnic of fruit with their mum. Then they lie back and gaze at the shapes in the clouds. This book is a gentle reminder of simple things and taking time to enjoy a garden. Secret message for grown-up readers: Turn off the TV. Unplug the XBox. Open up the back door. Send them outside to PLAY! Enjoy your kids while they are little. This is an Australian best-selling classic. It is a rhyming book that is a celebration of the Australian Coast. With children swimming, surfing and exploring rock pools, it is a book full of beach-side adventure. If you ever explored rock pools, fished from a jetty or built a bonfire under the stars as a child, this books serves as a reminder of the quintessential Aussie beach holiday. Secret message for parents: Do you remember the Summer holidays of your youth? Don't you want your kids to have those memories too? Audrey lives in the outback. When she loses her first tooth, she worries the Tooth Fairy will have trouble finding her. She sets about giving the Tooth Fairy directions to where she lives. This book has a gorgeous outback setting and a real Australian feel. Audrey is a feisty and determined child with a plan to ensure she doesn't miss out. Secret Message: The tooth fairy does not just bring cash! Wow! Who knew? Parents should read this aloud prior to their little one losing their first tooth. It will help manage expectations and save you money, as long as your children do not compare their loot with their friends. A cute little monkey farewells his legs, knees, arms and eyes, bidding them all goodnight. This is a magic bedtime story, particularly good for energetic, hard-to-put-to-bed children. It combines a little bit of relaxation, meditation and maybe even a touch of yoga. It is a soothing bedtime book. With phrases like "Shhh, mouth, no more questions, just say goodnight" and "Time to close eyes, can you see any dreams yet?" This one is perfect for ages 2+. Secret message: This one is for kids, and it is subliminal. Please, please, please go to sleep now! Uno discovers all sorts of animals in the jungle, including Moopaloops, Snortlepigs, and Puddlebuts. He builds a village that becomes a town and then a city which takes over the jungle. When the trees are gone, the people leave too. Eventually the jungle takes back what it once had. This is a moving tale about human impact on native animals and their environment. It is full of Graeme Base's detailed and vivid illustrations and is suitable for children age 5+. Secret Message: Are you one of the few people left in the world who do not recycle, or compost? You better get onto that. Your children are going to get wise on this topic very quickly! Children's Book Week is taking place from August 22-28. For more information visit here. Debbie Hatswell is the Founder and Director of Story Mama Children's Books and a Director of the Children's Book Council of Australia* (Views in this blog are her own and are not attributed to the CBCA).